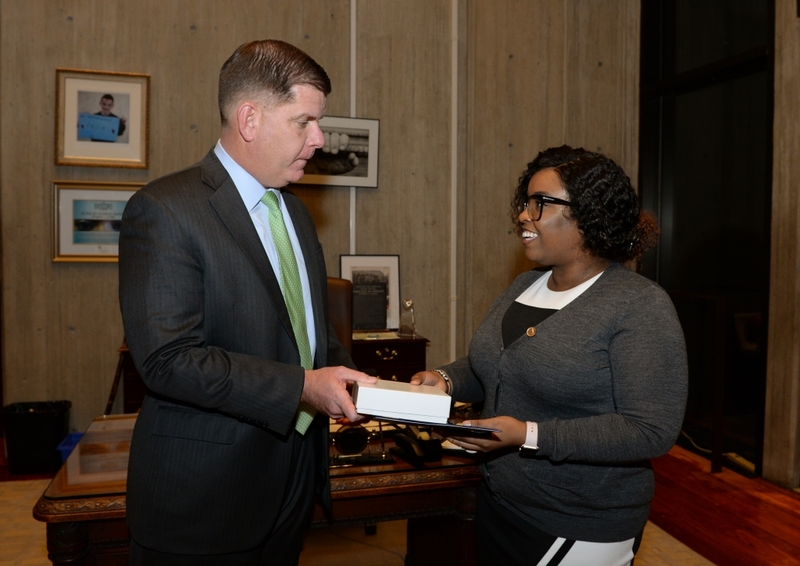 Boston Mayor Martin J. Walsh, left, presents Carnegie Hero Catherine Kinyua with the Carnegie Medal on Nov. 19 in Walsh’s office. Kinyua helped save a 32-year-old man from drowning in the Charles River in Cambridge, Mass., on Oct. 30, 2016. Following another rescuer, Kinyua, then 24, climbed over a highway railing to a ledge and jumped into the river, where the man had been floating face down. With the other rescuer, Kinyua helped to hold the man against a bulkhead while treading water until police arrived in a boat.